Get the right fit every time, with these handy shoe shopping tips. 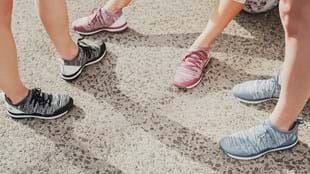 Whether you've recently embarked on a new group exercise routine, or if you’re a regular no-nonsense gym bunny, it’s important to make sure you’re wearing the best sports shoes for your sport. The right pair can definitely make your day, helping prevent pain and reducing the risk of injury later in life. The first step to finding perfectly fitting sports shoes is to analyze how you walk. The best way to determine how you walk, and what type of shoe you need, is by looking at the size of your foot arch. Your arch can be low, high or ‘standard’ and controls the way you place your foot when you walk. Check out your arch by doing a footprint test – wet your foot, step on a piece of paper and trace your footprint. The imprint shows which foot type you have: under-pronation, over-pronation, or a natural arch. If the footprint shows only a portion of your forefoot and heel, with a narrow imprint of the outer edge of your foot, then you have high arches and tend to ‘under-pronate’ (also known as supinate). Under-pronation means you roll your foot outwards, away from your knee, which causes pressure on the outer edge of the heel and the little toe. The best shoe for you is a cushioned shoe with a soft midsole to encourage your foot to move in to the center. If your footprint shows the entire sole of your foot with little to no curve on the inside, it means you have low arches or ‘flat feet’ which is called ‘over-pronation’. Over-pronate feet roll inwards and can create pressure on the outside heel and inside of your foot. You need to purchase a shoe that has maximum support to balance out and center the foot. If your footprint has a distinct curve along the inside of your foot, this means you have a natural arch and you wear your shoe evenly. The best shoes for your feet are a pair that has a good combination of cushioning mixed with support to keep the trend even. And hey, if you don’t fancy doing the wet-foot test, you can simply look at the sole of an old pair of sneakers which will highlight where your shoe has worn away the most and give you the same answer. Unlike other shoes, it’s important for your sneakers to feel comfortable right away, so don’t wait for them to ‘fit better’ or stretch after a few weeks. Your shoe should fit relatively tightly – snug and secure – not too tight across the top of your foot – and you should be able to wriggle your toes comfortably. Remember inside your shoe there should be about a ½ inch between the front of your big toe and the tip of the shoe. Take your own socks along on your shopping trip – a pair which you plan to wear when exercising, and if you wear orthotics, take them along too, to get the perfect fit. When is the best time to shoe shop? When shopping for shoes consider the best time to hit the stores – which is towards the end of the day. Your feet swell across the day, and they also expand during exercise, so try on shoes when your feet are at their largest. Your feet often change size as you get older too, so every year get a fitting to check your size. Buying sports shoes can be an expensive process, and with so many options on offer it’s hard to know right from wrong. While it’s justifiable to invest in a good pair of sports shoes – since you will be wearing them quite a lot – just be wary that you can pay a premium for fashionable or top branded labels which don’t necessarily do your feet any good. An expensive shoe doesn’t mean it’s a better shoe, so instead get the best fit for your foot. Finally, remember to replace your sports shoes every six to eight months, or when your feet start to feel uncomfortable. Another indicator that it’s time for a new pair is if you experience pain in your knees, ankles or shins – or the back of the sole is worn out, giving you less support. Check out the new Reebok + Les Mills Ultra Circuit trainers – the world’s first shoe purpose-built to meet the demands of LES MILLS™ workouts. Les Mills instructors and trainers were some of the first in the world to try the shoes out, and they’re now hooked! “You get excellent lateral support, cushioning and absorptive ability for jumping, good traction, but not too much so you can move quickly and change direction fast.” Brice Duckworth, Les Mills Instructor. “The right trainers are so important and these are great. I taught one class in them and now I’ve just bought another two pairs!” Steve Tansey, Les Mills Trainer. Learn more about the benefits of the Reebok + Les Mills Ultra Circuit trainers and get your hands on your own pair here.